Life on a Florida creek is lush, if you’re a human sitting beside it with an icy beverage and the ability to leave. If you’re a duckling, it’s a horror show, and your chances of survival are not great. 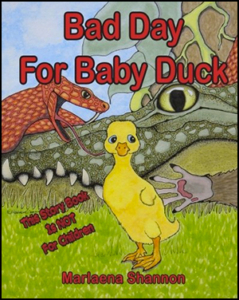 This richly illustrated picture book of the life and death of baby ducks is not for young children. If you’re a twisted adult who loves the nature channel and good artwork, this is the book for you. This is a storybook, coloring book, and beginning art instruction book all in one. 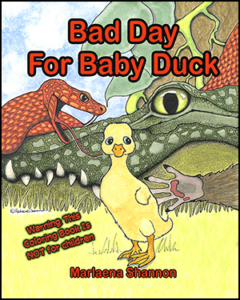 The story is based on what really happens to ducklings in nature. The coloring book is hand drawn in artist and writer Marlaena Shannon’s whimsical style. Between coloring pages, you’ll find hints and tips for coloring. This coloring book is definitely not for children, unless you want to make them cry.